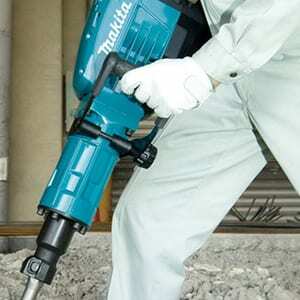 The Medium Duty Breaker is intended for chiselling work in concrete, brick, stone and asphalt. Before plugging in the tool, always check to see that the tool is switched off. The switch can be locked in “ON” position for ease of operator comfort during extended use. Apply caution when locking the tool in “ON” position and maintain a firm grasp on the tool. To start the tool, push the switch lever “ON (I)” on the left side of the tool. To stop the tool, push the switch lever “OFF (O)” on the right side of the tool. The blows per minute can be adjusted just by turning the adjusting dial. This can be done even while the tool is running. The dial is marked 1 (lowest speed) to 5 (full speed). Refer to the table below for the relationship between the number settings on the adjusting dial and the blows per minute. Blows at no load per minute become smaller than those on load in order to reduce vibration under no load, but this does not show trouble. Once operation starts with a bit against concrete, blows per minute increase and get to the numbers as shown in the table. When the temperature is low and there is less fluidity in grease, the tool may not have this function even with the motor rotating. The adjusting dial can be turned only as far as 5 and back to 1. Do not force it past 5 or 1, or the speed adjusting function may no longer work. The green power-ON indicator lamp lights up when the tool is plugged. If the indicator lamp does not light up, the mains cord or the controller may be malfunctioning. The indicator lamp is lit but the tool does not start even if the tool is switched on, the carbon brushes may be worn out, or the controller, the motor or the ON/OFF switch may be malfunctioning. The red service indicator lamp flickers up when the carbon brushes are nearly worn out to indicate that the tool needs servicing. After approx. 8 hours of use, the motor will automatically be shut off. 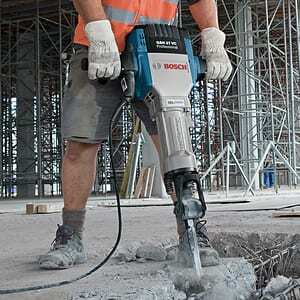 Always be sure that the tool is switched off and unplugged before carrying out any work on the tool. The side handle can be swung 360° on the vertical and secured at any desired position. Just loosen the clamp nut to swing the side handle to the desired position. Then tighten the clamp nut securely. With the notched portion on the shank of the bit facing toward the tool retainer, insert the bit into the tool holder as far as it will go. Then pull out and turn the tool retainer 180° to secure the bit. After installing, always make sure that the bit is securely held in place by trying to pull it out. Always assure that the bit is securely retained by attempting to pull the bit out of the tool holder after completing the above procedure. To remove the bit, follow the installation procedure in reverse. Always use the side grip (auxiliary handle) and firmly hold the tool by both side grip and switch handle during operations. 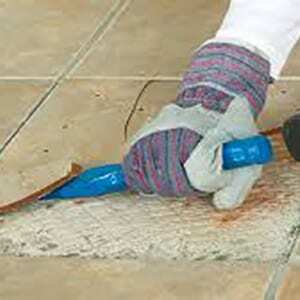 Turn the tool on and apply slight pressure on the tool so that the tool will not bounce around, uncontrolled. Pressing very hard on the tool will not increase the efficiency. 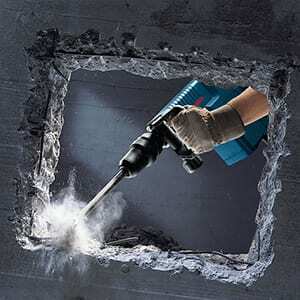 Hold power tool by insulated gripping surfaces, when performing an operation where the cutting accessory may contact hidden wiring or its own cord. Cutting accessory contacting a "live" wire may make exposed metal parts of the power tool "live" and could give the operator an electric shock. Be sure the bit is secured in place before operation. Under normal operation, the tool is designed to produce vibration. The screws can come loose easily, causing a breakdown or accident. Check tightness of screws carefully before operation. while by operating it under no load. This will loosen up the lubrication. Without the proper warm-up, hammering operation is difficult. Hold the tool firmly with both hands. Do not point the tool at anyone in the area when operating. The bit could fly out and injure someone seriously. Do not operate the tool at no-load unnecessarily. Some material contains chemicals which may be toxic. 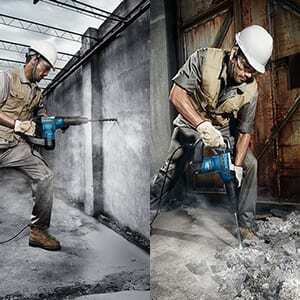 Take caution to prevent dust inhalation and skin contact.